in Summerlea, Edmonton Announcing a price drop on 209 17151 94A Ave NW, a 978 sqft , 2 bath , 2 bdrm apartment. Now FOR SALE CAD184,900 . 46 Davy Crescent in Davidson Creek, Sherwood Park is Sold! 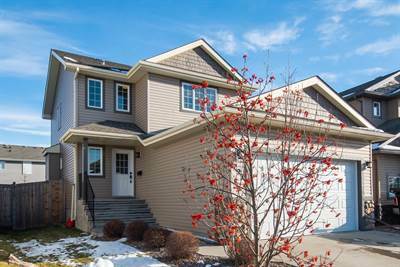 in Davidson Creek, Sherwood Park The 4-level split at 46 Davy Crescent has been sold. Posted on November 21, 2018 Categories UncategorizedLeave a comment on 46 Davy Crescent in Davidson Creek, Sherwood Park is Sold! 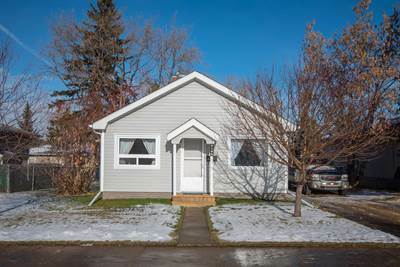 • 1091.58 sqft , 2 bath , 2 bdrm bungalow – FOR SALE CAD269,900 . Looking for a great property with future investment possibilities? Look no further! 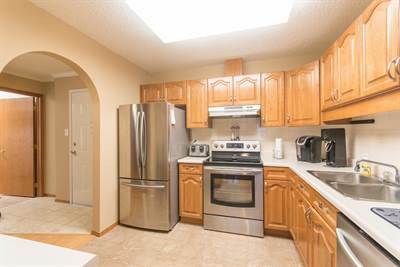 This immaculate 1100 sq ft bungalow has been updated and is move in ready! It features a huge master bedroom, large second bedroom, large kitchen, fully finished recently updated basement and with 3 piece bath and more. The garage is a do-it yourselfers dream! 28’x24′. For future consideration, the 59×120 lot may be sub dividable, or duplex ready and located within walking distance of Belvedere LRT station! Great location for a revenue property! The huge fenced in lot backs onto Belvedere Park which includes the community hall, skating rink, playground and Belvedere Elementary School. Check it out today! • 1391 sqft , 2 bath , 1 half bath , 3 bdrm 2 story – FOR SALE CAD364,900 . Attention first time home buyers! You CAN have a great house with a large double garage and still have a great yard! This house has it all! When you first walk into this home, you will notice a generous entryway — so important when you or your guests come in — space for everyone to take off their shoes. The foyer connects to the garage, large coat closet and 2 piece bath. The open concept main floor features a great room concept. 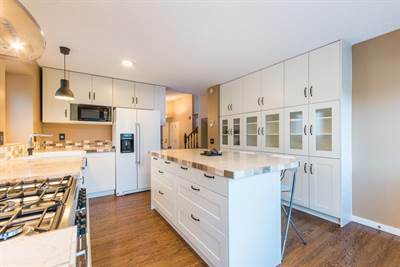 The huge kitchen features gorgeous island, stone backsplash, extra tall upper cabinets, two large built-in spice racks, two full sets of pot drawers, glass door end cabinets on the island, stainless steel appliances (including a brand new stove and microwave hood fan) and a large pantry. Next to the kitchen you will enjoy a generous dining area with large patio doors that open to the connecting the outside living space to the inside. The welcoming living room has a cozy natural gas fireplace and large windows that overlook the back yard. Upstairs you will find 3 generously sized bedrooms and the laundry room. It just makes sense to have the laundry room where the clothes are. There master bedroom includes a large closet and full ensuite bathroom and each of the bedrooms are bright and welcoming and have closet organizers with mdf shelving, not that cheap wire stuff. The gorgeous back yard has been professionally landscaped to include a beautiful stone patio with built in fire pit, deck for BBQing, and loads of space for the kids to play! Stones were brought in for between the houses, and included is a nice shed. The 20×24 garage is big enough to fit a truck and has ample storage. This home is located in a quiet family friendly area in Leduc with wide streets and great neighbours!! Additional features include Central Air conditioning, low E windows, 35 year architectural shingles, stone veneer accents on the exterior of the home and more. When you first walk into this home, you will notice a generous entryway — so important when you or your guests come in — space for everyone to take off their shoes. The foyer connects to the garage, large coat closet and 2 piece garage. in Summerlea, Edmonton Announcing a price drop on 209 17151 94A Ave NW, a 978 sqft , 2 bath , 2 bdrm apartment. Now FOR SALE CAD189,900 .